In January 2012, I was starting to get serious about figuring out my next career move and I was prepping for a speaking engagement I had on the east coast. The person who was organizing my speaking engagement had a friend in Los Angeles that she felt I should talk to. I am pretty much always open to talking to anyone and actually believe that you can learn something from every conversation you have if you are open to it. So I set up a call with this woman, Jennifer who runs a marketing agency in Los Angeles. We talked about work, life, work-life balance…. and during this conversation she told me about a book that within minutes of hanging up with her, I downloaded on my Kindle app. 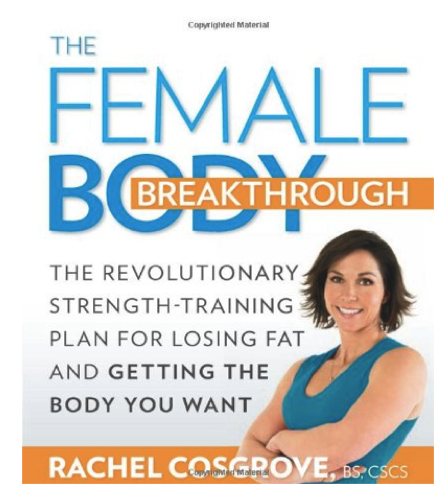 It’s called The Female Body Breakthrough, the Revolutionary Strength Training Plan for Losing Fat and Getting the Body You Want by Elizabeth Cosgrove. It is filled with great information on nutrition, what to eat, when to eat, as well as a 16-week great weight workout for women program. Now keep in mind, at the time, I was watching Live with Kelly (before Michael) pretty regularly to kick start my day with a laugh before hunkering down on my job search. And when I started to read this book, I thought that getting Kelly Ripa-toned arms was somehow in reach. Well I may not have arms quite like Kelly’s, but I can tell you that they’re far more defined than they were. I work out with this program 2-3 times a week…. And take my ipad with me to the gym so I can look at the sketches of the exercises for reference. My favorite exercise is part of the warm of the warm up; it’s called Bent-Over Y-T-W-I. You can see it from her book here I started with 2-3 lbs weights and moved to 5 lbs weights. This book was a real life changer for me. While some of the text didn’t really reach me, the exercise program definitely did. The exercises are all doable with some effort, and you definitely start to get stronger, feel stronger and believe that you can take on the world — and get the body you want. This entry was posted in Blog, Healthy Living on July 13, 2013 by Leslie.